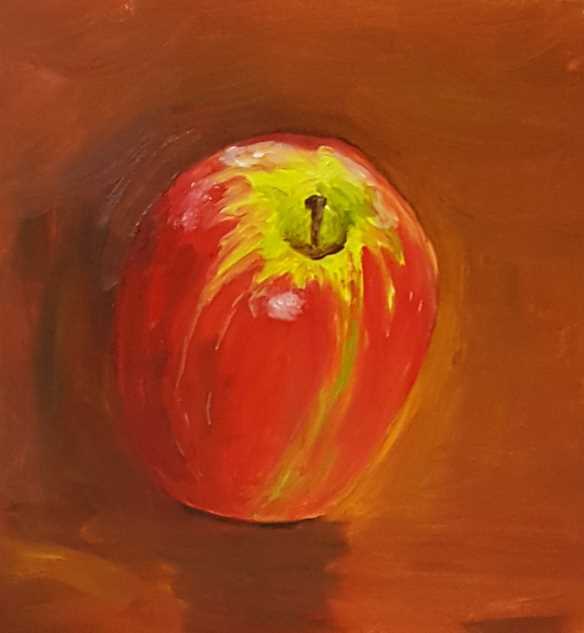 My 8th class in ‘Produce Paintings’ and ‘Produce Drawings’ (these being subjects that are part of ‘Certificate III in Visual Arts’) was a challenge as usual, but this week during my ‘Produce Painting’ class I felt I had more personal creative success. 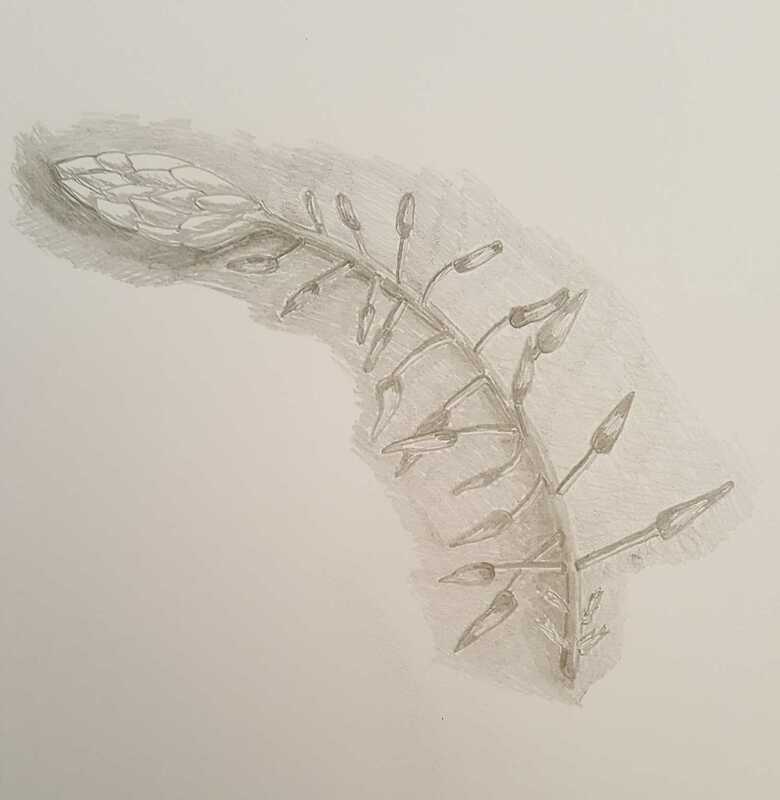 And during the ‘Produce Drawing’ class we had the opportunity to use a new medium which was interesting and fun, and a lovely way to complete the day’s creative efforts. Now for a two-week break! 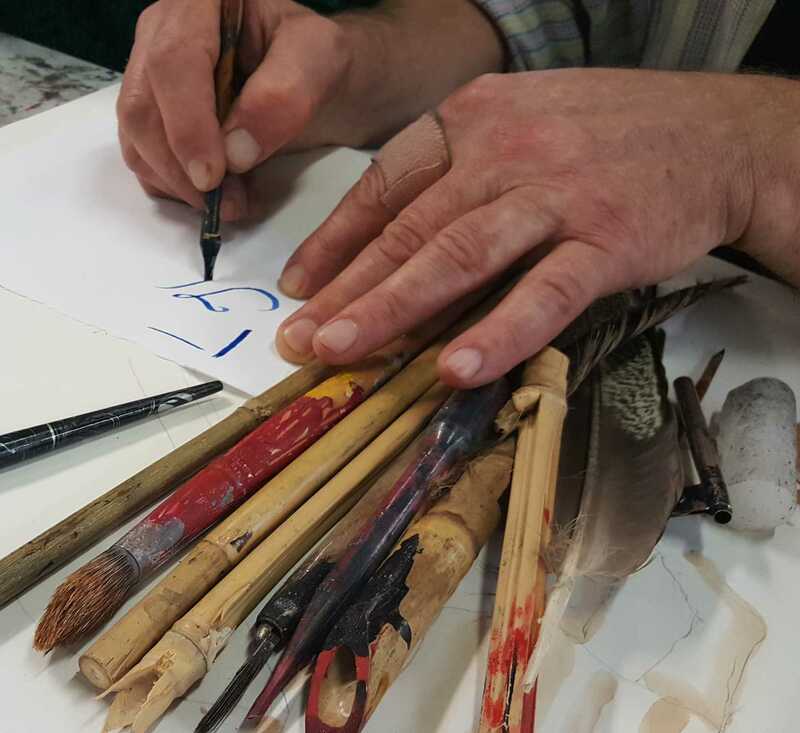 NB: To view my blogs about previous classes, please click on the links given here – Classes 1, Classes 2, Classes 3, Classes 4, Classes 5, Classes 6 and Classes 7 and for this week’s classes 8 for ‘Produce Paintings’ and ‘Produce Drawings’ – please scroll down to view. Our ‘Produce Painting’ class commenced with our teacher, VIN RYAN, checking in with each of the students individually. Vin also talked about the process used to stretch a canvas, the use of Gesso as a universal primer on canvas and about oil paint brush types. Vin indicated that the purchase of stretched canvases can be an expense that art students can struggle to afford, and having the knowledge to stretch one’s own canvases can be a good way to save money. During the ‘stretch a canvas’ demonstration, Vin explained that we needed to ensure we allowed enough canvas to wrap around the outer edging of the wooden frame, and allow enough canvas for the underside of the wooden frame itself. Stapling should start in the middle of each arm of the wooden frame, then working outwards and towards the corners. And at all times stretching the canvas with the tool especially designed to do this task, so that the canvas ends up taut and sounding like a drum when tapped, on completion. The corners are folded in firmly and tightly as per the image below and as shown on the YouTube video. 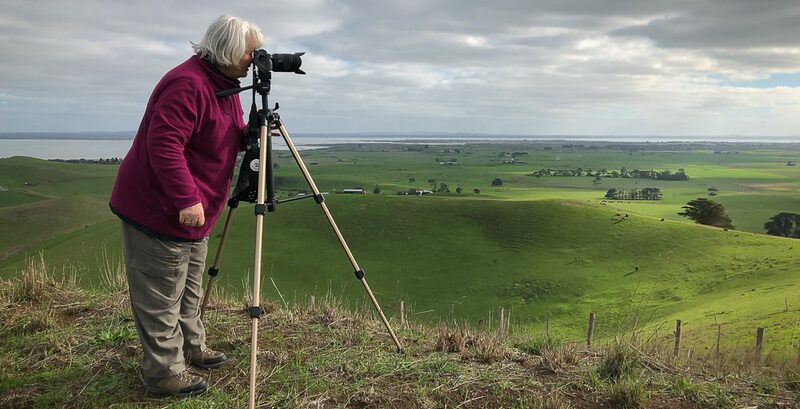 Please find below a YouTube video produced by Joh Peters. It basically follows the same stretch canvas methods and use of tools that Vin used during his demonstration in the ‘Produce Paintings’ class. We also learned about priming a canvas using Gesso so that the surface of the canvas is ready for paint to adhere to it. Vin explained that Gesso is usually white or off-white in colour and is made from paint pigment, chalk and binder although traditional oil ‘glue Gesso’ was made of animal glue binder, usually rabbit-skin glue, chalk, and white pigment – Titanium White. Coloured Gesso can be purchased premixed black, coloured and clear, and it can also be coloured by simply mixing a little paint to tint the Gesso (Will Kemp 2015). We also learned that when preparing a canvas with Gesso, you need to use a wide flat brush and the bigger the canvas surface, the bigger the brush needed. Vin explained the importance of scrubbing the Gesso into the canvas surface to ensure a good coverage is achieved. Once the canvas is completely dry, he said we could use a sheet of very fine sandpaper to gently sand over the canvas to achieve a really smooth painting surface. Artists Hog Brushes – “Finest quality traditional hog brush, handcrafted using Chungking bristles, flagged ends for best colour carrying capacity and available with long handles” (Winsor & Newton 2016). Monarch Brushes – “Professional synthetic hair brush, mimics natural mongoose hair, designed for oil colour and for subtle blending, glazing and detail” (Winsor & Newton 2016). 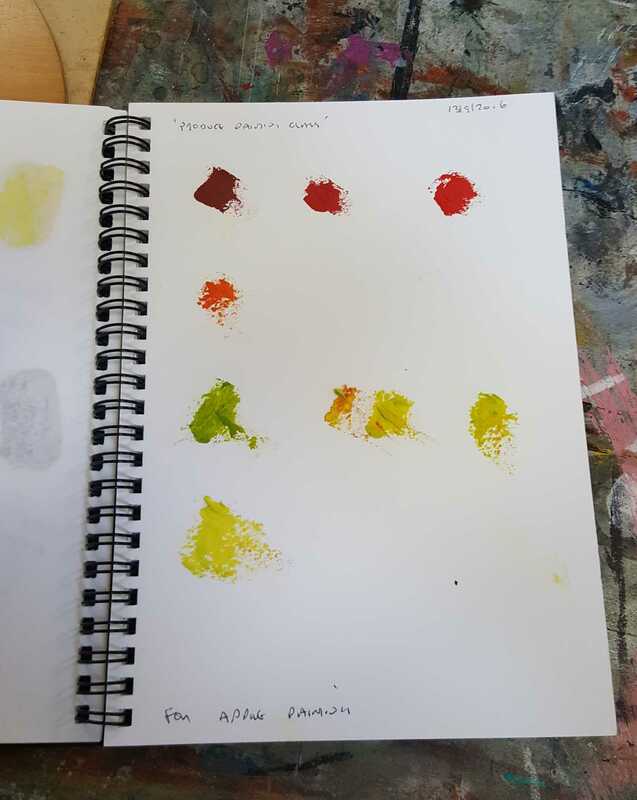 Artisan Water Mixable Oil Colour Brushes – “For use with Artisan Water Mixable Oil Colour, synthetic fibres which performs like hog, maintains shape and spring when used with water, and can be cleaned with soap and water” (Winsor & Newton 2016). Winton Hog Brushes – “Natural bristle brush, designed for use with Winton Oil Colour, curved bristle maintains shape, and allows control and accuracy” (Winsor & Newton 2016). Azanta Black Brushes – “Value for money hog hair brush, for oil and acrylic painting, great for beginners, and good stiffness for thick colour” (Winsor & Newton 2016). 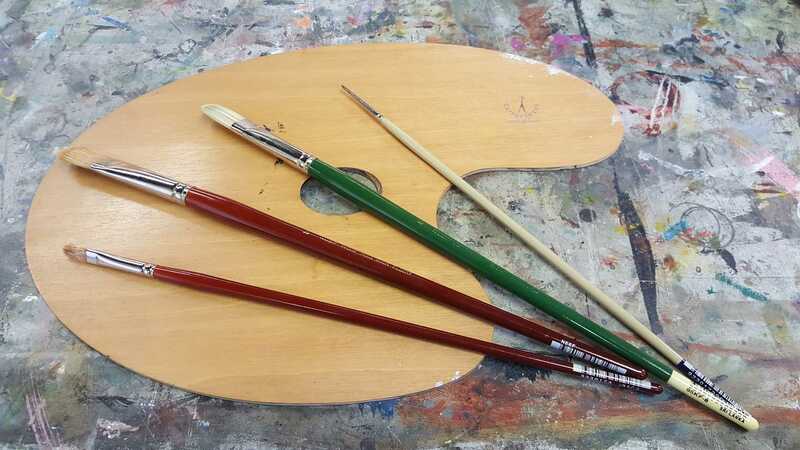 University Brushes – “Synthetic all-purpose brushes, stiff enough for oil and acrylic, soft enough for watercolour, and less visible brush marks” (Winsor & Newton 2016). Foundation Brushes – “Natural hog bristle, available in long and short handles, and can also be used for acrylics” (Winsor & Newton 2016). Art Purchases:- Before class commenced I stopped in at the Senior Art Supplies store on Degraves Street to purchase ‘Art Spectrum Brush and Hand Cleaner‘ so that I could clean my brushes and hands after using oil paints. “It is non-toxic, non-abrasive, biodegradable and contains no harsh solvents” (The art Scene 2012) which is good as we must think about chemical use and the environment. Vin, the art teacher, also confirmed that this product “cleans and also restores old brushes that are stiff with dried up paint” (The art Scene 2012). He also suggested that leaving a little of the cleaner in the brushes, until ready for use, can help remove any residue from the brush as well. You just need to give the brush a good wash and wipe before using again. I also purchased some ‘AS Odourless Solvent‘ which is a “low odour alternative to Artist Turpentine for people sensitive to turpentine” (The Art Scene 2012). It is used for thinning paint and cleaning brushes. 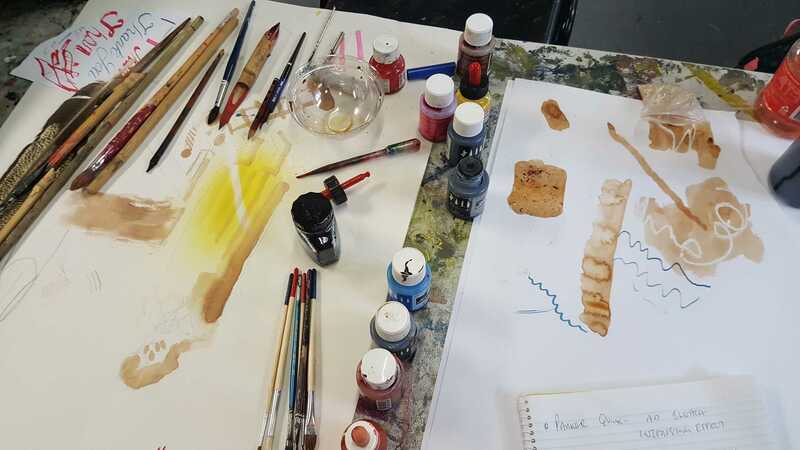 Class Set Up: – First task on the agenda was the setting up all the painting materials. 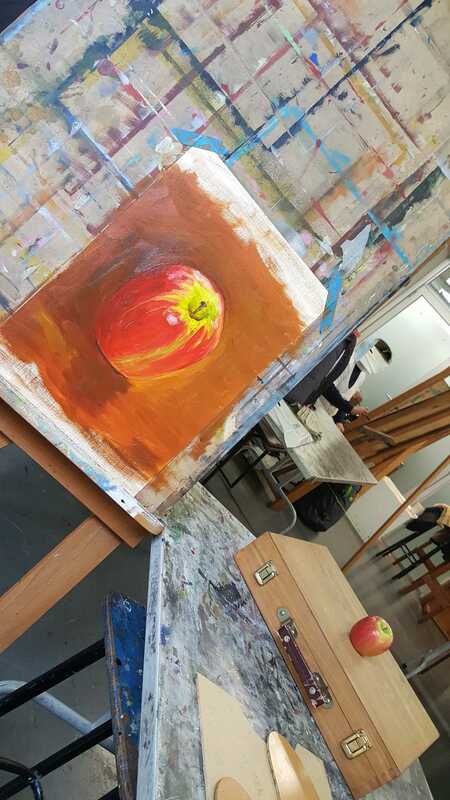 Then by simply placing my apple on the artist box, it was ready for me to paint! 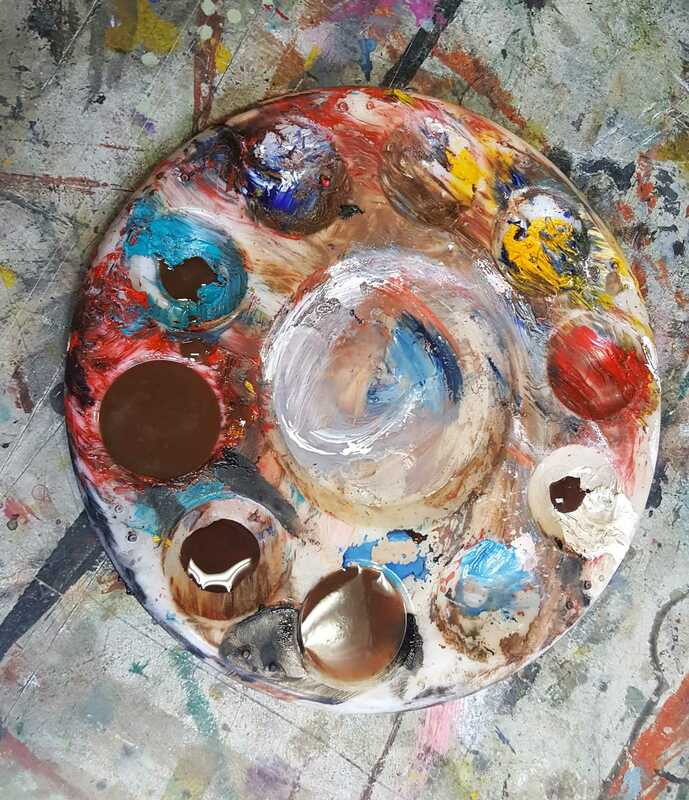 Painting Palette: –Then I set about preparing my oil paint colour palette for use in creating the ‘apple’ painting. Trying to mix just the right colours before commencing was an enjoyable experience and once set I was ready to start. Below is a photo-story of my painting palette (1) colours straight from the tubes, (2) colours mixed in readiness to start painting and (3) how my painting palette looked at the completion of my painting of the apple. Painting Visual Diary: –Before starting the actual painting, I brushed each colour tone onto one of the pages in my painting visual diary. 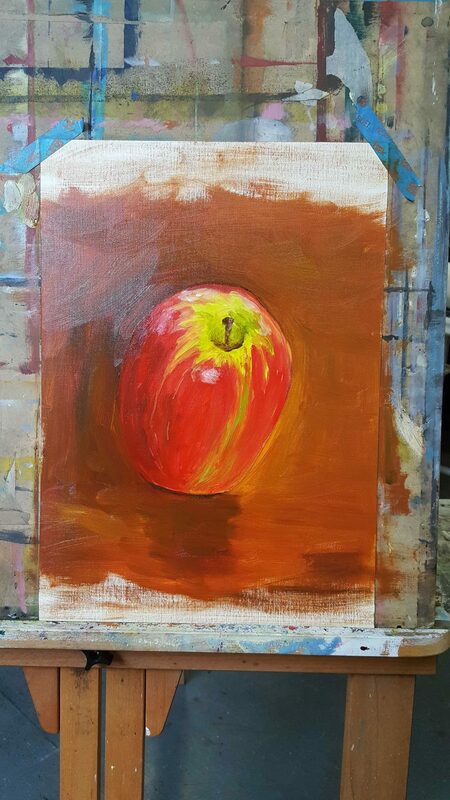 Completed ‘Apple’ Oil Painting: – On completion of my ‘apple’ painting I was pleasantly surprised – it looked like an apple! Even Vin, the teacher said that it looked like an apple, that it looked like he could take a bite out of it – this made me very happy. Our ‘Produce Drawing’ class commenced after our lunch break. This gave me a chance to recharge after the ‘Produce Painting’ class. The teacher, TIM JONES, firstly checked in with each of the students individually. Tim also talked about and demonstrated the process of using ink for drawing and showed us some of his ink drawing work as examples. Tim had a variety of ink brands to demonstrate with during this class session but his favourite to work with when drawing in ink is Schmincke. Schmincke ink comes in 36 brilliant shades and is ideal for many mixing techniques such as brush, dip-pens and technical pens (Schmincke 2016). It has the “highest possible light-fastness (4-5 stars) and has outstanding adhesion properties on many surfaces” (Schmincke 2016). “Due to their finest pigmentation, they can be used pure but can also be diluted with medium or with water” and “adheres particularly well to all sorts of papers and cardboards as well as the usual, non-absorbent surfaces such as film, hard plastics and – after appropriate preliminary treatment – metal” (Schmincke 2016). Schmincke ink colours are “easy to mask and excellent for graphic designs and special airbrush techniques” (Schmincke 2016). and shown how to use sawdust by scattering it onto wet ink and, once fully dry, removing it thus leaving behind another interesting effect. Tim explained one of his favourite ink drawing techniques being the use of different strengths of ink when creating a drawing. First, starting off with the weakest strength, then working in with a medium strength and finishing up with full strength ink. One of his favourite ink colours is ‘Sepia’ a reddish-brown colour, named after the rich brown pigment derived from the ink sac of the common cuttlefish Sepia and, when diluted, it is quite opaque. 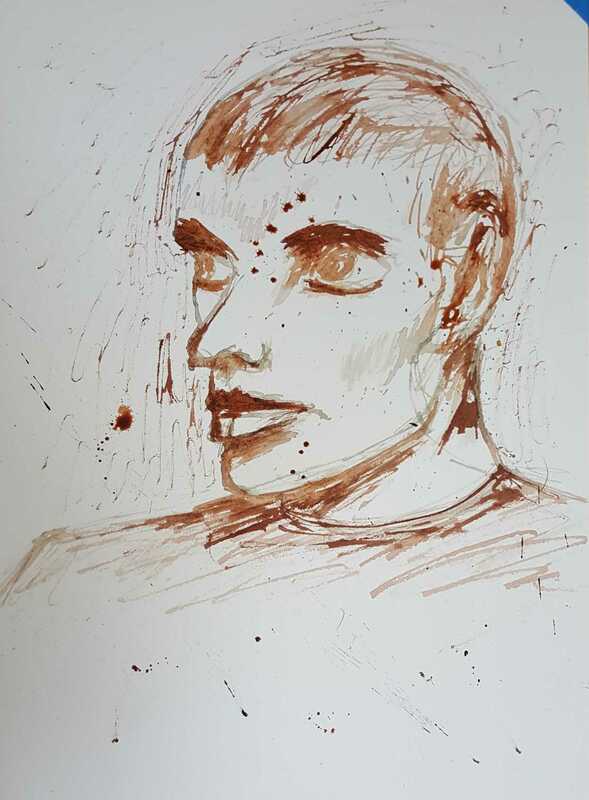 Another favourite ink colour of Tim’s is Sanguine, a reddish-brown colour/the colour of blood. Tim kindly showed us some of his personal ink drawing artwork including beautiful Visual Journals and sheets of ink drawings, some which had been created during overseas travels to his home land, and other ink drawings of people, and places he had travelled to during his life. Our drawing project for this session involved choosing an image from a stack of images provided by our teacher, then selecting ink and tools to draw with on paper. Tim recommended Arches Hot Press 250 grams would be best for ink drawings. But I had brought with me from home some ‘Arches Watercolour’ Medium 300 gsm paper, so I used this for my in-class ink drawing. Arches states that “Arches Watercolour paper has a harmonious natural grain, the fibres are evenly distributed, making the paper more stable, with very limited deformation. It is made of long 100% cotton fibres, and can absorb a lot of water without warping or causing the colours to bleed. It is sized to the core with natural gelatin, which means it can be scratched without tearing or linting. It also preserves the lustre and transparency of the colours whilst preventing paints penetrating into the thickness of the paper” (Aches 2016). 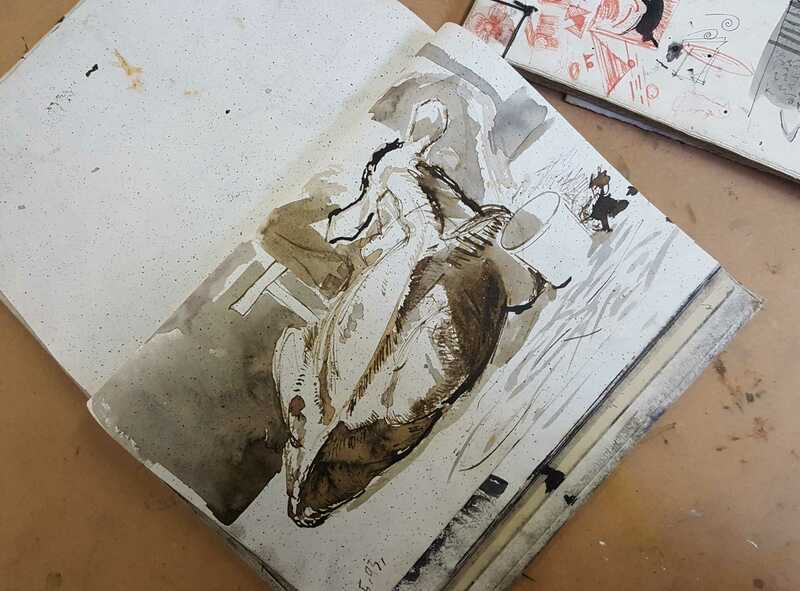 I decided to use a brownish coloured ink and draw my ink drawing as per Tim’s approach to his ink drawings, starting with the weakest ink, an outline drawn in first, then followed by the medium strength ink next and lastly the full strength ink. Step 1,2,3 shown in the images above and below. Below is my finished ink drawing! In between classes I only got to do a single drawing in my visual diary. 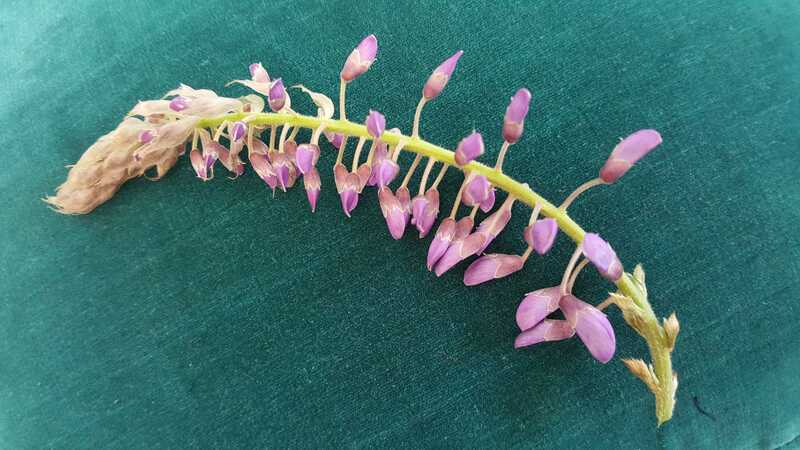 The Wisteria vine growing in our back garden is flowering and one of its flowers was my source of drawing inspiration. Am always feeling very fortunate in being able to participate in these painting and drawing classes. My early morning train journey into the heart of the city of Melbourne via Flinders Street Station; being able to soak up the ambiance of Degraves Street itself during my class break; and the walk today to Federation Square – very much adds to the overall pleasure of the day’s creative outcomes. Art for therapy at its best for sure…. 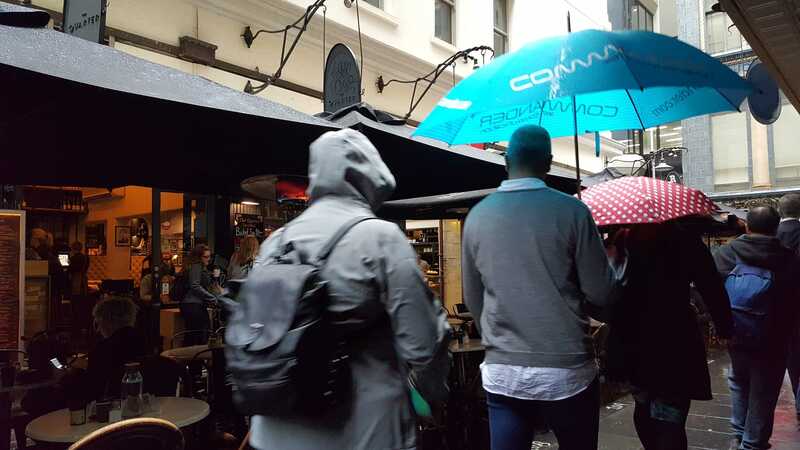 It’s always a good time – Doughnut Time at 5 Degraves Street, Melbourne, Australia “specialise in hand-dipped doughnuts created in small batches for a big following. The doughnuts are crafted across multiple locations (Brisbane, the Gold Coast, Sydney, Melbourne and with vans constantly doing the rounds) and are carefully designed to make you fall in love, with flavours spanning from the conventional (original glazed, salted caramel, jam and cream) right through to the unique (maple bacon, hibiscus and nerds)” (Doughnut Time 2016). This entry was posted in CAE Cert III Visual Arts, My art and tagged Certificate III in Visal Arts, Degraves Street, Drawing, Gesso, ido art karen robinson, Ink Drawing, Karen Robinson, Oil Painting, Photograpy, Tim Jones CAE Drawing Teacher/Artist, Vin Ryan CAE Painting Teacher/Artist, visual diary, Winsor & Newton Paint Brushes by idoartkarenrobinson. Bookmark the permalink.